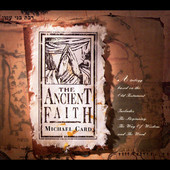 Last weekend I listened, once again, to Michael Card’s CD, The Ancient Faith, a musical tour through the Old Testament with an underlying theme of the coming of Christ. Even though it is nearly 20 years old it is still a marvelous work for a variety of reasons. Not the least, it honours Scripture. We have on this album, magnificent Biblical themes which are combined with appropriate and beautifully composed music. To me, it epitomises what good Christian music can be. It would be difficult for a believer to listen to this and not a. worship and praise God, b. gain greater insights into the Bible and c. be inspired by the love of God. One way Michael Card does this, for me, is by expressing Scripture from the point of view of various characters. The most striking is “The Song of Gomer” as she reflects on Hosea’s love. In fact, Gomer’s song becomes our song as we reflect and rejoice in the love that Christ has given us. If you haven’t listened to this album for while, find it and find a quiet room and a quiet hour or so and let Michael Card minister the Word to you. What Christian albums speak to you? I would love to hear your responses. I agree, that Michael Card CD in particular, is a good one. “Holy is His Name”–that song was a power horse in my personal worship for many, many nights when I first became a Christian. I think I owned maybe three of his tapes. (Tapes-yikes!). Thanks for the great recommendation, Pieter. I’ll look out for this CD. It is not Bach! But it is great Christian music.